Every family should have its own designated party giver. When VegKitchen diva Nava Atlas was growing up, that meant her Aunt Blanche. "She was the family hostess, she set the style," recalls the author of many meatless cookbooks including "Vegan Holiday Kitchen." "It was never anything fancy, but comfortable, generous and gracious. She was someone to aspire to. She helped everybody. And everyone loved her." Aunt Blanche would have approved of "Vegan Holiday Kitchen," which offers favorite dishes for every holiday. As Atlas puts it, it's "tradition with a twist." The twist is a vegan makeover. Let's be clear -- vegans like to party, too. We just choose not to do it with ham. Or brisket. Or lamb. Or all the other meaty, eggy, milky dishes that seem to make up a traditional holiday table. "Our pleasure should not come at the cost of harming other creatures," says Atlas. Happily, those of us who like to eat and party well need not suffer, either. This was not always the case. Atlas went meatless, back in the 1970s, when meatless meals were boring, brown and bland. "Being vegan today is easier," she says. "The products taste good, vegan, there's ethnic eateries everywhere." And there's "Vegan Holiday Kitchen." Atlas shows holidays can be bountiful and not an animal harmed. Beloved winter holiday hits go meatless, including vegan holiday cookies spiced with cinnamon and ginger, mock chopped liver (cashew, onion and mushroom pate) and "vegg" nog, thick and rich with almond milk and cashew butter, liberally spiked with rum. The spirit of the season remains but anything animal is excised. "I love being part of the vegan community," says Atlas. "It's so supportive. We get more admiration. A lot of people say, 'I wish I could be a vegan,' not, 'Wow are you crazy?'" For vegans who may not run with such an enlightened crowd, "Vegan Holiday Kitchen" offers tips on navigating tricky social situations, like the family dinner where your aunt insists you eat the roast she slaved over (because what's a family holiday without a little guilt or passive-aggressive behavior?) or the office party where everything contains bacon, including the cocktails (bacon-infused bourbon. It happens). not only has her Aunt Blanche's way with a party, she has her generous nature, as well. Atlas is donating a portion of "Vegan Holiday Kitchen" royalties to the New York Coalition for Healthy School Food, a statewide nonprofit advocating for more nourishing school lunches, including local, organic and plant-based options. Though Atlas had been meatless since her teens, she, along with her husband and two sons, "became vegan as a family, the four of us -- it's a really powerful thing. We were making the same statement, we were all on the same plate. I was always so grateful we could be on this path together. It's such a gift." Her family prefers to keep holiday celebrations low-key. And plant-based. 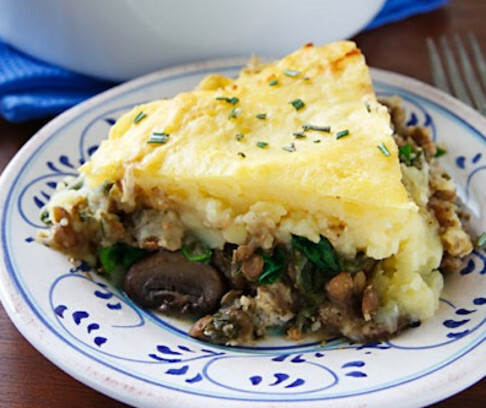 Atlas may dish up her vegan shepherd's pie, rich with lentils and mushrooms and entirely sheep- and lamb-free. For her, the holidays aren't so much about formal religion, they're about "that oasis of comfort we create in the midst of our busy and often uncomfortable lives. The food we serve and how we serve is more than what's on the table, it's what's behind it." Reprinted with permission from "Vegan Holiday Kitchen" by Nava Atlas, copyright 2011, published by Sterling. If you're looking for what Atlas describes as "that oasis of comfort," this dish is it. Add the spinach, a little at a time, cooking just until it's all wilted down. Remove from the heat; taste to adjust seasonings to your liking. This post originally ran on December 11, 2011.